Many people feel stuck when they get dreads, meaning they have dread locks and that's the end of it. Even though beads are a fun way to dress up dreads, its not the only way.. If you are like me and changed your hair a lot before dreads, you can still do all those fun things with dread locks! I am continuously adding different color threads, yarns, and fabrics into my dreads.. This is a super fun way to play with colors and change up your dreads as often as you like. Also I love to experiment with different colors, even though dye is not the greatest thing for dread locks, it is not the worst either!... Another fun idea is to buy different color hair and twist it around your dreads, cross-cross designs, or candy cane swirls.. the sky's the limit! 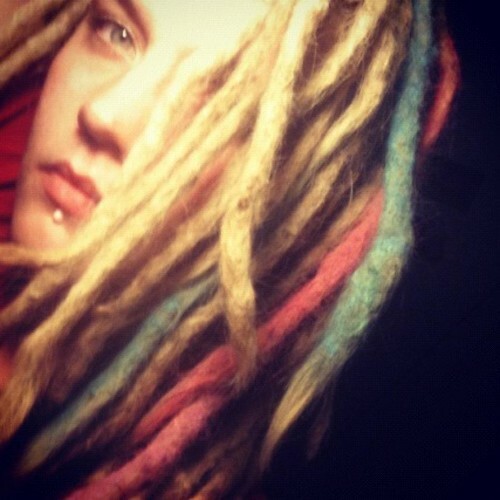 Please any one who is as experimental with their dreadies as I am please share some new ideas for dressing up dread-locks..
Have you tried chalking the tips? Chalking is a way to get a fun no commitment color into the hair that washes out. You would use soft (not oil-based) pastels and lightly dust the strands. I've done this with loose hair before and it was a lot of fun and easy to rinse away. I've not tried any coloring in a really long time though so I am not sure if anyone has tried this with dreads... just curious and asked. ive had my dreads so caked in mud they were 3-5 times as thick zas normal just from all the caked on mud..does that count? I don't have a Flickr account so I have no way of messaging her to see how it washed out but, it looks nice.